The GLTF is committed to promoting women-friendly events and tennis teams in the greater Bay Area. 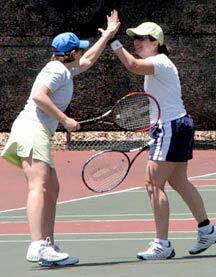 Throughout the year, we offer numerous opportunities for social, recreational, and competitive tennis. We offer USTA League teams for the Adult Season, Combo Doubles (all women, but multi-ranking), Mixed Doubles (both men and women) and Senior Doubles (women 50+). In all of our events, we like to keep the emphasis on having fun. That's not to say that we don't want to win -- many of us have strong competitive spirits -- but we tend to emphasize participation (everyone plays) over competition. The club membership includes women of all playing levels, from advanced to just beginning, so you can be sure to find a good match for your abilities. Please send any questions to our Women's Director. Social events, a holiday party, and a new group of friends! Playing on a team is a great experience and the fastest way to meet fellow GLTF members. We play four seasons of USTA Teams: Senior Season in the Winter, Adult Season in the spring, Mixed Season in the summer, and Combo Season in the fall. We have teams from 3.0 beginners to 4.5 advanced players in both San Francisco and the East Bay. Find out more about playing on a USTA team here. If you have questions or would like to join a team, just email our Women's Director. You can get directions and maps to our courts here.